Obesity experts urge Senate to consider how unhealthy food is marketed to kids in obesity inquiry. 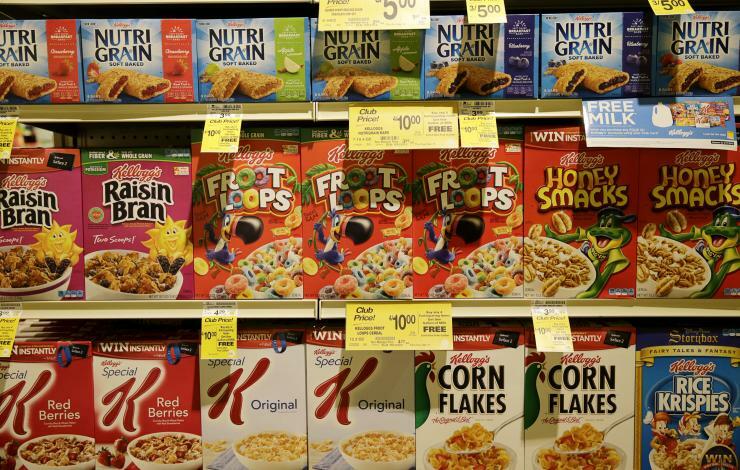 Kids’ snacks and breakfast cereals featuring cartoons or character promotions are almost guaranteed to contain too much sugar, new research from the Obesity Policy Coalition (OPC) has revealed. Even though not as many kids’ dairy snacks were high in sugar, this category held the worst offenders for amount of sugar per serve. A tub of Choc Yogo with m&ms, with its goofy cartoon gorilla on the lid, contains a whopping eight teaspoons of sugar (21% of the product). “Kids are easily lured by fun, colourful characters on food packaging,” said OPC Executive Manager Jane Martin. How the food industry has contributed to childhood obesity will be a focus of a parliamentary inquiry into Australia’s obesity epidemic. The inquiry will also examine evidence-based measures to prevent childhood obesity. Other sugary kids’ snacks included the Nice’n’Natural Fruit Frogs, which are 60% sugar, and the Scooby Doo Iddy Biddy Fruity Bits, which are 57% sugar (2.6 and 2.9 teaspoons of sugar per serve). Both Frosties and Goldenvale Tweety’s Honey Wheats breakfast cereals are around 40% sugar (3.1 and 2.9 teaspoons per serve). For maximum health benefits, the World Health Organization recommends adults consume no more than six teaspoons of added sugar, including fruit concentrate, in a single day. Children should consume even less. It’s not just the packaging that’s been carefully designed to tempt children – the sugary products themselves are also designed to keep kids coming back for more, Ms Martin said. Ms Martin said the OPC wants to see a compulsory, strengthened Health Star Rating System that recognises that sugar processed from fruit is still sugar, and rates products accordingly. The OPC is also calling for clear ‘added sugar’ labelling on the packaging, which includes sugar from fruit pastes and concentrates, and a 20% health levy on sugary drinks. Submissions to the parliamentary inquiry into Australia’s obesity epidemic are open until 6 July, with a report due 14 August. This OPC survey looked at 53 dairy snacks, 30 snack bars, and 41 breakfast cereals that featured cartoons or character promotions. *The analysis was conducted using the Australian Department of Health’s recommendations around limiting foods with sugar more than 15 grams of sugar per 100 grams. Foods that did not meet this threshold were considered high sugar. The OPC is a partnership between Cancer Council Victoria, Diabetes Victoria and the Global Obesity Centre at Deakin University, a World Health Organisation Collaborating Centre for Obesity Prevention. The OPC advocates for evidence-based policy and regulatory change to address overweight, obesity and unhealthy diets in Australia. Foods with the most sugar per serve in each category, according to the analysis. This information is accurate as of September 2017.